What the Hell Is Any Given Wednesday? 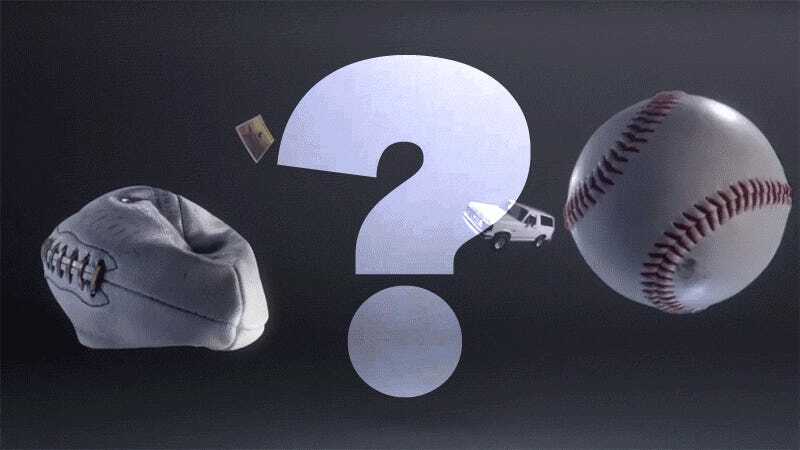 The opening sequence of Any Given Wednesday, HBO’s new weekly talk show about things Bill Simmons thinks are cool and fun, follows a bunch of stray objects floating inside a vacuum, which must be a metaphor for something. As the rapidly cut segment goes on, we watch all the sports balls, sports shoes, and sports gloves mingle with a few non-sports-related pieces of memorabilia (like a Hamilton Playbill and a pair of red, white, and blue boxer shorts) as they get pulled into the gravitational field of a planet that, I assume, represents Bill Simmons’s brain. “Look at all of this straight man’s interests!” the credits appear to scream. If only I understood more than 1% of them. Plenty of shows are not for me, but the extent to which Any Given Wednesday falls outside of my comprehension zone is truly mystifying—and I’ve seen several seconds of a NASCAR race. Even Bryant Gumbel’s sports-centric HBO series, with its traditional newsmagazine format, is more palatable than this meandering assortment of men talking to and at each other about other men who throw things for a living. I pitched this idea to my boss, a sports-lover named Emma, before watching. “Wouldn’t it be funny,” I proposed, “if I recapped Any Given Wednesday every week by discussing all the things I did understand? And the joke is that it’s a small list? !” Ha ha! Sure! In theory, maybe! Our hero, manspreading on one of the many leather seats in the Billcave. Simmons begins Episode 3 in the exact same way I imagine every straight man who refers to his friends as “buddies” has begun all his conversations since Tuesday morning. “Welcome,” he says with his legs spread wide on one of the many leather seats inside his man cave-themed soundstage. “I’m still a little punchy from the NBA steamrolling my July 4 weekend.” I’m sorry, what? I’m still a little punchy from the NBA steamrolling my July 4 weekend? I tried imagining that line said by someone else with a voice I found more familiar and soothing—maybe Lauren Bacall’s—and yet it still did nothing for me. “Lauren, darling, what the hell are you talking about,” I imagined myself telling her, to no avail. Simmons then compares his weekend NBA trauma—I think it’s something akin to how I felt when Birdman won Best Picture—to Yahoo buying Tumblr (a reference I should have understand in theory but don’t), and then brings out a tall man I’ve never seen before and a less-tall man—one I do know of, and like—named Anthony Anderson to discuss the issue further. The tall man, I quickly find out, is a basketball player named Chris Bosh who is quite good at his job. I notice that Simmons is an odd interviewer. Though undeniably knowledgable, he looks uncomfortable on camera (it often looks like he’s about to cry) and speaks to his guests as though reading from cue cards he’d written himself just before taping. Anderson, who I’d hoped would act as an avatar for those of us who care little about sports, quickly alienates me by responding to Simmons and Bosh with incomprehensible musings about “clippers” and “heat” and whether or not one tall basketball player is lying about his height to make himself seem shorter. At one point, Anderson mentions a name I recognize, and my ears perk up. “You know who was really affected by me? Glenn Close,” he says with a smile. “She couldn’t handle me.” My moment! This is my moment. But then, as though I was being personally targeted for exclusion, Simmons ends the segment. The final part of the show, I soon discover, is even more incomprehensible than the first. As previously mentioned, it’s a discussion between Simmons and Joe Rogan—that Joe Rogan—about UFC 200, which appears to consist of men who beat each other bloody for a living. Rogan refers to this sport, mixed martial arts, as “extreme problem solving with dire physical consequences.” I roll my eyes and block out the sound of his voice to figure out what it is about him that seems so... different. Though I recognize his name from the early 2000s series Fear Factor, his shaved head and muscular upper body look nothing like I remember. I feel like it’s OK to discuss Rogan’s appearance because the bulk of this segment is about him discussing the bodies of fighters. One is described as having a good and normal one. Another is described as “the bone structure of a viking” and a head and torso that are both “way too big.” Simmons thinks this is funny. I flick my finger on the trackpad of my laptop to see how much time is left. The two then have the following exchange. BILL SIMMONS: Give me one UFC 200 prediction. JOE ROGAN: It’ll be awesome. Before long, the credits roll. As my brain begins to recover from such a sports-heavy workout, I stare at the screen and think, “Is the title of this show a reference to something?” But that, I decide, is a question for another Wednesday.